Our top five favorite Lincoln Nebraska attractions are listed here, along with a description of each + location, hours, fee information, and the minimum time needed to visit or tour the attraction. If you are just visiting, we hope you enjoy your stay in our beautiful Eastern Nebraska city. If you live in Lincoln, Nebraska and you haven’t yet seen these favorite Attraction sights, you’ve been missing out. 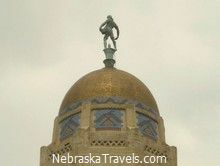 -- a Lincoln, Nebraska "Must See"
The Nebraska State Capitol Building is a beautiful piece of architecture completed in 1932. The Lincoln, NE skyscraper is covered by a golden dome and topped with a sculpture of a farmer sewing grain. Paintings and murals inside the building depict the Native American heritage of the area, along with the history of pioneers that settled Nebraska. 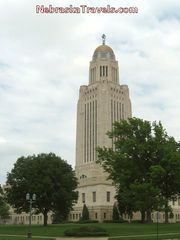 The Nebraska Capitol building is the second tallest of U.S. state capitols and the tallest building in Lincoln, NE, making it really easy to find. An observation deck at 250 feet offers an aerial view of the rest of the city. The location is 1445 K Street. Construction began on this Nebraska Capitol Building in Lincoln on April 15, 1922. The construction on this Capitol Building took 10 years. The tower is 400 feet tall and made of limestone. This is actually the third State Capitol building in Lincoln, Nebraska. The first two, built in 1867 and 1882, ended up having structural problems and ended up unsafe for use. Guided tours of the Nebraska Capitol building are available every hour except noon Monday thru Sunday during regular operating hours. Minimum time needed if you do not go up to the observation viewing deck, 2-3 hours. More Info at the Nebraska State Capitol Web Site. 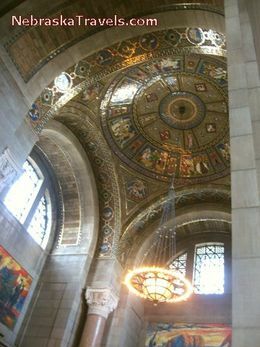 Take time to take some pictures of the interesting Nebraska State Capitol Building and the beautiful gold rotunda dome. To History and Photos of the 3 Nebraska Capitol Buildings. See this Photo Album for a few Nebraska High Res Photo Downloads + some Non-Watermarked Printable Photo Downloads of our Scenic US Beach Vacation Travels, USA Scenic Attractions, and Historic US Lighthouses. If you’re wondering what to do in Lincoln, Nebraska and you have kids, the Lincoln Children’s Museum is fun, entertaining and educational. With daily events and special programs, there is always something interesting to do. Also see the Lincoln Children's Zoo Info below. The Children’s Museum is located at 1420 P Street and is open every day except Mondays. Children under the age of 1 get in for free. Both the Kids and the Adults will enjoy the Lincoln Children’s Museum! Minimum time needed, 3-4 hours. More Info at the The Lincoln Children’s Museum Web Site. Take your camera so you can take lots of pictures of your Kids and Grandkids having fun! If you have Kids, the Lincoln Children's Zoo at 1222 S 27th St. is also a top rated Fun and Educational Attraction. The popular Lincoln Children's Zoo has won some National Awards! There are many fun and educational "Up Close and Personal" experiences for Kids with the animals. They also have some educational and fun Summer Camp Options. Lincoln Children's Zoo Facebook Page. See Lincoln Children's Zoo current hours, admission and ride prices, plus other Zoo Info Links here. The Lincoln Sunken Gardens is listed in National Geographic’s Guide to Public Gardens as one of the 300 best gardens to visit in the U.S. and Canada. It is open every day from 6 in the morning until 11 at night. Admission is free, although donations are accepted for park maintenance and renovations. The 1.5 acre Sunken Gardens Plot was first developed in 1930 and was recently renovated in 2004.
and shrubs, numerous outdoor sculptures, several ponds and a new waterfall. It is a beautiful place for a pleasant stroll or a picnic lunch. 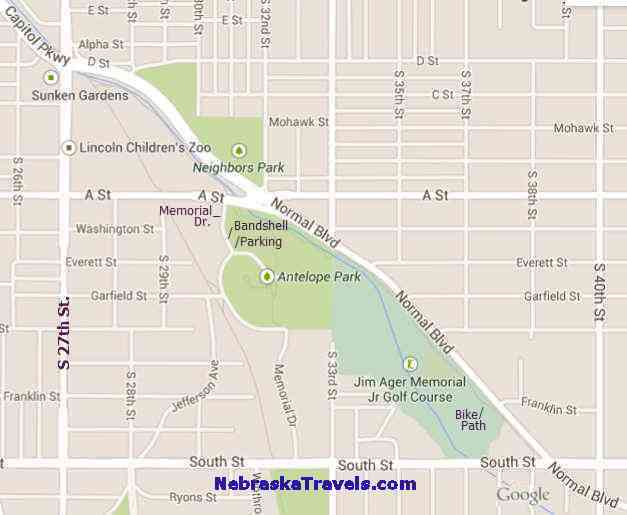 The Lincoln Sunken Gardens is located on the SW corner of South 27th and Capital Parkway. The Entrance is at South 26th and "D" Streets. This Link has Parking and Viewing regulations Info. Minimum time needed to view the Lincoln Sunken Gardens Park, 2-3 hours. 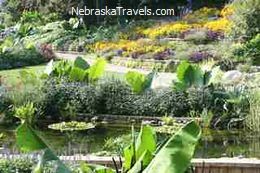 More Info at the Sunken Gardens, Lincoln, Nebraska Web Site. Outdoors, so it is easy to take a few colorful Lincoln, Nebraska Attraction Picture memories. 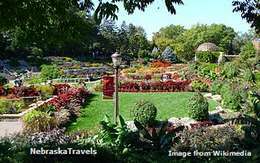 Check out more Lincoln Sunken Gardens and Lincoln Nebraska State Capitol Building Pictures and Info on our Eastern Nebraska + Lincoln & Omaha Pinterest "Board" page. The University of Nebraska State Museum is sometimes called the Elephant Hall because of the University’s vast collection of fossil elephants. Thousands of other Nebraska fossils are housed in the natural history museum, as well as displays covering Native American history, wildlife and gemstones. The museum is located on the University of Nebraska campus, just south of 14th and Vine Streets in Lincoln. Minimum time needed, 3-4 hours. More Info at the University of Nebraska State Museum Web Site. Photos are not allowed in most parts of the Museum. They can be purchased. Generally, this one will be more for the Guys (Gene would probably Rank this Top Attraction #4). The "Speedy" Bill Smith huge collection of Historic automotive artifacts including Vintage Speed Equipment, Exotic Racing Engines, Racing Cars, Toy cars and Kids pedal cars, plus various historic cars and one-of-a-kind auto memorabilia. This very well done and well kept museum gets rave revieiws -- including Gene's! More Info, Tour times and Location Info, plus some pictures under the "Collections" Tab at: Bill Smith Museum of American Speed The Museum of American Speed also sponsors some Automotive Events in Lincoln, which you can read about under the "Events" Tab at the link above. The museum has regular exhibits of quilts created by a variety of artists. The museum is open 10-4 Tuesday through Saturday and on Sunday from 1-4pm. Minimum time needed, 2-3 hours. Flash pictures of the now Historic Quilts are not allowed. More Info on The International Quilt Study Center and Museum Web Site. 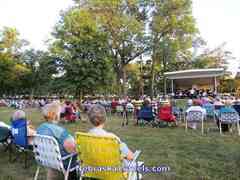 You can see Info on upcoming Lincoln Municipal Band Concerts at this Calendar of Events Listing as well as download a Seasons Events and Info Flyer pdf. Other Lincoln, NE attractions include the Governor’s mansion, Haymarket Park and the Maxwell Arboretum. You might run out of time before you see everything that the city of Lincoln has to offer. Check out User Reviews and Rankings of Lincoln, Nebraska Hotels -- Find Hotels That Travelers Trust. Over 40 Million Unbiased Reviews! 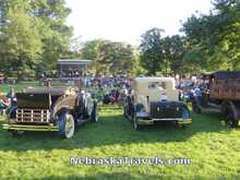 The list of the Nebraska Travel and Nebraska Vacations pages here now with descriptions and links is below. Smith Falls Waterfall & Niobrara River Pictures - Tallest Waterfall in Nebraska Pictures + Waterfall Video and Smith Falls State Park Info & Pictures - a Nebraska Sandhills "Must See"
Scottsbluff, NE Map with the local area Attractions labeled and briefly described. A very handy printable Scottsbluff Nebraska map. See these High Resolution Photo Preview pages for over 30 popular non-watermarked high resolution photos from all 4 of our "Picture Enhanced" US Vacation Sites. Includes Image Viewer stats. Free "Comp" downloads are available. Thanks for dropping by -- come back and visit us soon to plan your next Affordable Nebraska Travels -- or to check out our latest Picture or Video additions! 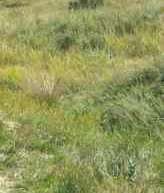 Contact Us - Gene Seecann - Send your suggestions or comments for this or any of Gene's US Vacation Web Sites on this Gene Seecann Sites Comment Form Page - or share your own Nebraska Travel and Nebraska Sandhills favorites or pictures. Please mention which page(s) you are commenting on -- or send your comments on the Nebraska Travels Site in general. We appreciate your feedback! We will not share, sell, or spam your email address! - Promise! - We hate Spam too! To top of this page - Lincoln Nebraska Attractions -- 5 Top Picks for What to do in Lincoln, Nebraska page -- Our 5 favorite Top Pick Lincoln Nebraska attractions, along with a description of each + location, hours, fee information, and the minimum time needed to visit or tour the attraction.